Tingwei begins her studies as a sophomore at Padua. For many students, the transition from grade school to high school is difficult enough but for Tingwei S. ‘19 it means even more. Tingwei is known throughout Padua as a brilliant student, who always has a smile on her face. Born in Hubei, China, Tingwei has started her sophomore year at Padua, and couldn’t be happier. “I really like all the people I’ve met here”, says Tingwei. 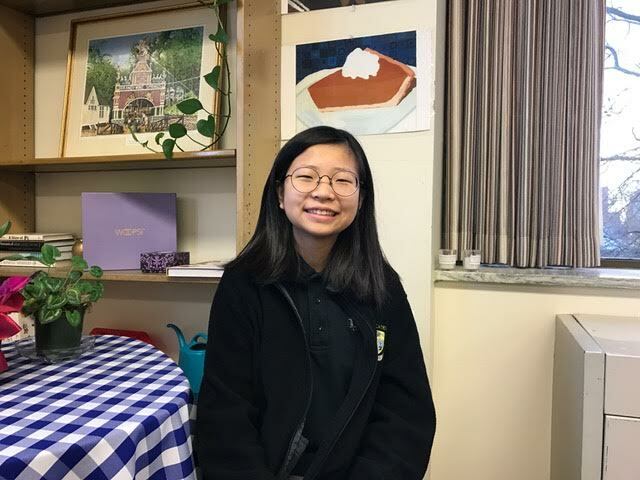 Tingwei says that she enjoys all of her classes at Padua, and is currently learning about a topic she didn’t while she was in China. “In China, we have math, Chinese, and English, but we don’t have a religion”, says Tingwei. When asked about the differences between school in the United States and school in China, Tingwei says “Back in China, we don’t switch classes like here, but the teacher moves from class to class”. She also describes small things such as in China students’ belongings are kept in a small desk, rather than a locker. Tingwei says “When I learned about this program [studying in the United States] my mom wanted me to go because she loves me and wanted me to learn more”. When asked about her favorite memory at Padua so far, Tingwei says “I don’t really have a favorite, I just hope that I remember it all for a long time”.